Waterlines by Marian Leven & Will Maclean is located in the public space in front of the RIAS 2013 award winning The Sir Duncan Rice Library at the University of Aberdeen. The shape of the piece, two monoliths of Kilkenny Blue Limestone, and form of incised lines evokes Pictish carvings. The piece also refers to the Aberdeen built sailing ship the Thermopylae, launched in 1868: apparently the fastest sailing ship ever constructed. 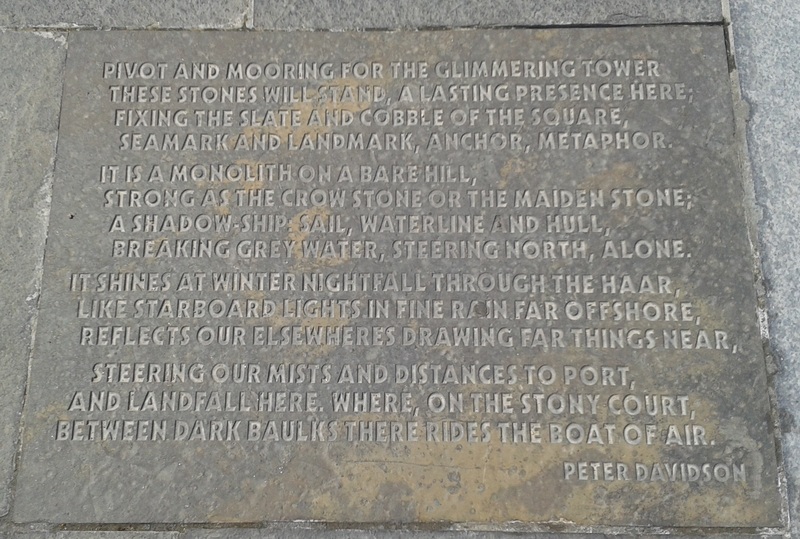 It clearly evokes the maritime heritage of Aberdeen but also refers to the standings stones which can still be found in the wider landscape referring to the ‘crow stone’ and ‘maiden stone’. For more thoughts about this piece, from the artists Will Maclean and Marian Leven, please watch the video. Well worth watching about Past Inspired Sculpture: markers in the landscape. For more info about Waterlines there is an interesting review by Georgina Coburn at Northings. This entry was posted in Creativity, Heritage and tagged Architecture, art, creativity, Heritage, Marian Leven, Peter Davidson, Pictish, Poetry, Public Art, RIAS 2013, Sculpture, The Sir Duncan Rice Library, University of Aberdeen., Will Maclean by gmacg1. Bookmark the permalink.